Traction may be an option to treat your condition if you are not fit for surgery. Skeletal traction may be applied under local anaesthesia, where screws, pins and wires inserted into the femur and a pulley system is set up at the end of the bed to bear heavy weights. These heavy weights help in correcting the misaligned bones until the injury heals. Unstable pelvic fractures: Have breakage at two or more points, followed by severe bleeding. Unstable pelvic fractures may cause shock, extensive internal bleeding, and damage to the internal organs. It requires immediate medical care followed by long-term physiotherapy and rehabilitation. Treatment of the pelvic fracture depends upon the severity of the injury and condition of the patient. Minor or stable fractures can be treated with conservative methods such as rest, medications, use of crutches, physiotherapy, and if required minor surgery. These methods may take 8–12 months for complete healing. 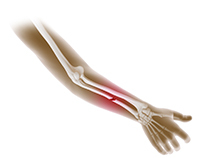 Forearm fractures in children can be diagnosed by analysing X-ray images of the wrist, elbow or the forearm. In the long run, the forearm of your child may have a slightly different or crooked look than before the fracture, which is normal. It may take around 1-2 years for the bones of the forearm to straighten while the bones undergo the process of remodelling (reshaping). For growth plate fractures, your child’s doctor will carefully monitor the hand for many years to ensure that growth occurs normally. physiotherapy: Early progressive range of motion exercises is essential in restoring full shoulder function. Your physician will most likely refer you to a Physical Therapist for instruction on proper exercises and early motion of the shoulder to prevent complications.